Hanoi (VNA) – Vietnam gained positive economic achievements in the first quarter of this year despite a range of difficulties both in and outside the country, Prime Minister Nguyen Xuan Phuc has said. Chairing a monthly Cabinet meeting in Hanoi on April 2, PM Phuc said the GDP growth was estimated at 6.79 percent, while the macro economy was stablised and the foreign currency reserve has been on the rise. The inflow of foreign investment increased by nearly 31 percent, with 4.12 billion USD disbursed, and total revenue from retail sales and services rose 12 percent, he added. During the reviewed period, Vietnam’s exports continued to expand amidst the global economic slowdown, helping the country to enjoy a trade plus of 536 million USD in the first three months of 2019, PM Phuc said. The government leader highlighted the promising outcomes in budget collection, reaching almost 27 percent of the estimates, and establishment of new businesses, with more than 28,400 enterprises set up, along with low unemployment rate. Although the global economy is predicted to slow down this year, international organisations still have a positive outlook on Vietnam, he said, citing the growth forecast by the Asian Development Bank (ADB) and the World Bank (WB) at 6.8 percent and 6.6 percent, respectively, higher than the predicted average growth of 6 percent in Asia-Pacific. Apart from challenges caused by the global economic slowdown, Vietnam will have to suffer from pressure in foreign direct investment (FDI) attraction as China’s Foreign Investment Law is set to help raise the country’s competitiveness in this field, he warned. Given this, the PM asked ministries and localities to take measures in order to step up foreign investment attraction, thus creating resources for national economic development. He urged ministries, agencies and sectors to uphold their responsibility and overcome these challenges to fulfill the yearly targets, saying the greatest efforts should be made to ensure the economic growth target and comprehensively address social issues, especially in culture and education. 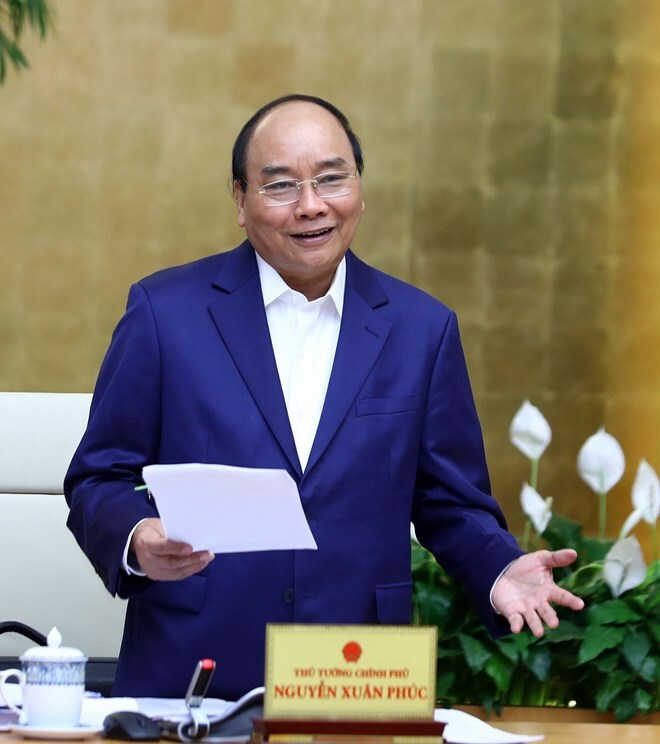 Given the disbursement of capital sourced from the state budget dropping 30 percent year-on-year, PM Phuc asked the Minister of Planning and Investment and other relevant ministries and agencies to clarify the problem and take strong solutions to accelerate the disbursement in April. Mentioning the credit growth rate of only 2.38 percent as compared with the yearly target of about 14 percent, the PM asked the State Bank of Vietnam to employ measures to support production. In the sphere of environmental protection, he requested the Ministry of Natural Resources and Environment and localities to work harder to encourage the public to reduce the use of plastic products, helping to handle plastic waste, especially along Vietnamese beaches. Regarding the recently-announced provincial competitiveness index, the PM asked localities to pay more attention to such issues as transparency, personnel training quality, corporate support and administrative reforms in land, tax and customs. PM Phuc also pointed out many social issues of public concern, which, he said, must be addressed soon and completely.